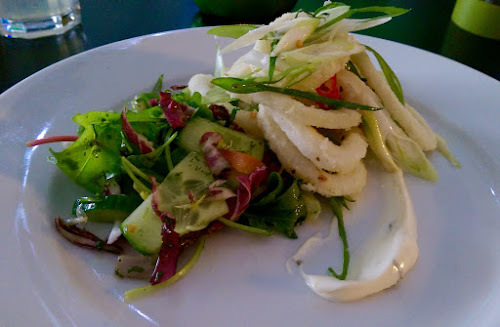 A couple of weeks ago I was invited to try out the new evening menu at Bell & Felix in Shawlands in Glasgow's southside. Open for just over two years, by day Bell & Felix serves up freshly brewed Illy coffee, loose leaf tea, light lunches and delicious home baking, whilst switching gear on the weekend nights to serve hearty home cooking to the locals. Nicola had to travel down south for work so with a night off from cooking, I made my way along to Bell & Felix on a cold snowy April evening. 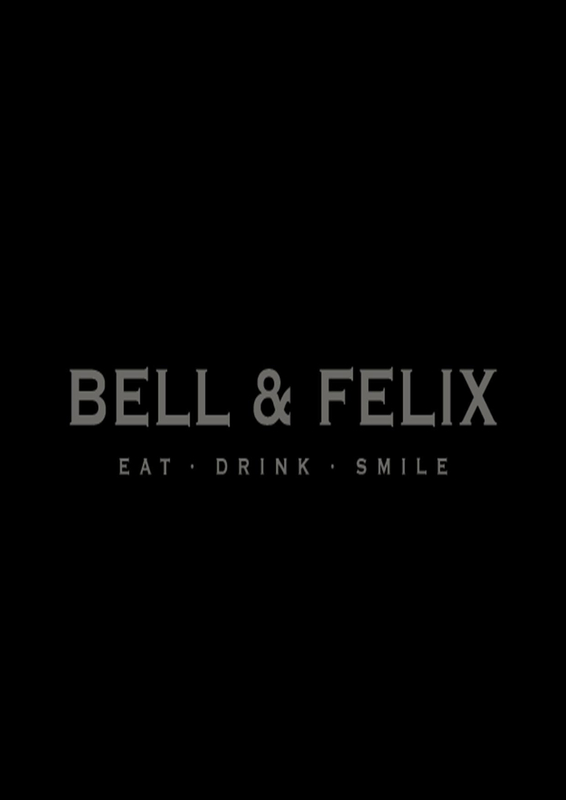 The cafe is within walking distance of both Shawlands and Newlands and I'm sure that on the warmer spring and summer evenings, Bell & Felix will be a very popular. There is a pretty decent wine list on offer but as I was driving, I ordered a can of San Pelligrino Limonata to go with my dinner. I struggled to choose my starter as the menu seemed to have been written to tick all my boxes but in the end I opted for the Salt & Chilli Fried Squid with Lemon Aioli. The squid was as good as I've had in a long time. Thick rings of fresh squid, dusted in a spicy seasoning were cooked to perfection and served with a sharp lemon aioli that was a nice balance to the chilli squid. 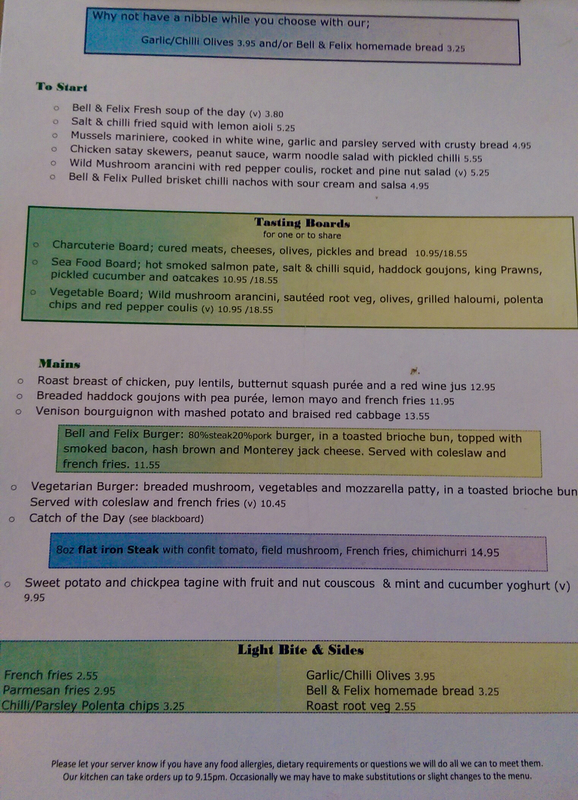 When it came to deciding on my main, I had another difficult job choosing as everything on the menu sounded delicious. It didn't help that there was also a specials board that had mouth watering options too. I eventually ordered one of the specials - Pork Loin with black pudding mash, bacon, cabbage and a wholegrain mustard & cream sauce. This was a collection of most of my favourite things and was cooked to perfection. 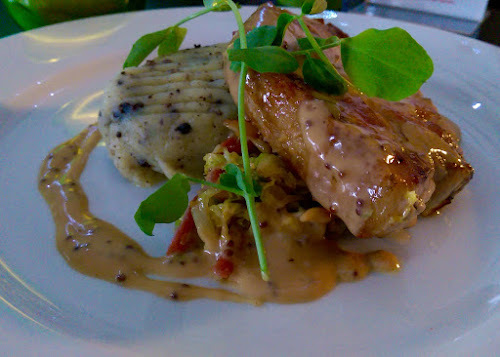 The huge pork loin was crispy on the outside and juicy on the inside, served on a bed of creamy mashed potato with a good handful of spicy black pudding crumbled through it. The flavours kept on coming with salty bacon, buttery cabbage and a punchy mustard sauce that rounded this dish off wonderfully. Both courses were generous in size which meant that I didn't have room for dessert but did manage to knock back a strong Illy espresso before making my way home. 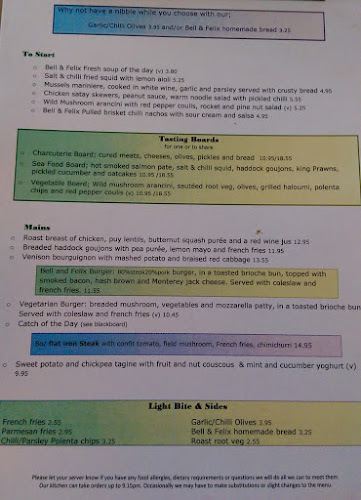 I was invited along for the purpose of reviewing the evening menu but the report above is an honest write-up based on my experience on the night. 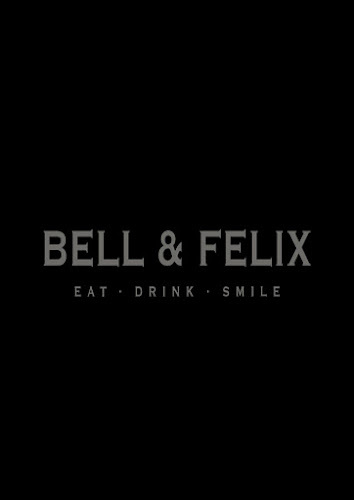 Bell & Felix have set up to serve up hearty home cooked food in comfortable surrounding and deliver in spades. In fact, I was almost back last Wednesday with Nicola for dinner before remembering that they only open late for dinner Thursday to Saturday. Bell & Felix are open Monday - Wednesday 8am - 6pm, Thursday- Friday 8am - 10pm, Saturday 9am - 10pm, Sunday 9am - 6pm.